Disfrute de un traslado desde el Aeropuerto Internacional de Galeão (GIG) o el Aeropuerto Santos Dumont (SDU) a su hotel en el centro de Río, seguido de un completo recorrido por la ciudad. 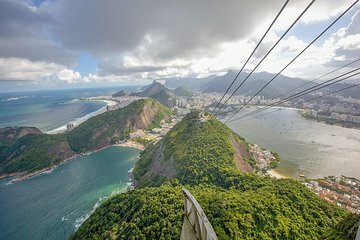 Visita la montaña Sugar Loaf y la estatua del Cristo Redentor en la cima de la montaña Corcovado. Haga un recorrido a pie por la Plaza de Cinelândia y el Palacio Imperial. Deténgase en las escaleras de Selaron y en la Catedral Metropolitana de Río, y escuche los comentarios informativos de su guía local en el camino. Termine su recorrido con el regreso a su hotel de Río. Realice un recorrido turístico por la ciudad tras el traslado al aeropuerto. Realiza un recorrido a pie por la Plaza de Cinelândia y el Palacio Imperial. Parada en las escaleras de Selaron y la Catedral Metropolitana de Río. Vivianne, our local guide, spoke excellent English. As our family of 3 were the only ones on the tour, Vivianne looked after us like a friend..introducing us to this lovely city she calls home. We had bought 'Skip the Line' admission tickets to both the Sugar Loaf and Christ the Redeemer, which saved us lots of time. She also stopped at interesting places of interest so we could have time to savour the moment. As she took us around in her car, she went out of her way to stop by the steps with the colourful tiles because my daughter had heard so much about it...though it wasn't on our itinerary.Though we had only the weekend at Rio,we felt that we have fallen in love with Rio in that short time..as we saw it through the eyes of a guide who loves this city! Thank you Vivianne!! Vivian could improve by talking more about history of the places we saw. I wished she had stopped a little bit so we could get lunch. She picked up from airport in the morning at 9am, and went on a city tour but didn't stop for lunch when asked 2x. After the trip, we were so hungry and could only eat dinner. To do this transfer and tour is a WONDERFUL plan!!! Vivian was waiting for us at the airport and confirmed, as we had planned, to take us on the tour the following day as our arrival was early and we were exhausted from an all-night flight. However, she took the long way to our hotel so she could give us a little overview of Rio and some of it's highlights. This was a grand intro! And Vivian's English is super: she did live in LA for 10 years! The following day, she picked us up at our hotel with a diver, Edvino, who was also terrific!! He's a great driver on some steep, narrow, winding and busy streets! What a plus! And our tour of Rio was just EXCELENT!! We saw all the most important sights Christ the Redeemer was the highlight of all our trip! but never felt rushed. Vivian answered all our questions and gave us lots of background info. We felt completely safe in her capable hands at all times. Thank you, Vivian!!! You really made our trip! The owners of this business are very pleasant and accommodating. Our group of four was coming to Rio de Janeiro for a cruise vacation. Our arrival flight was delayed by 24 hours so we missed our one night hotel stay, and it was also arriving after the recommended time for doing the tour. With a brief phone call, our airport transfer was changed to the following day and we were transported to the cruise ship terminal inside of the originally planned hotel. The tour was changed to the following day, and one hour early so that we could get the complete tour and still have time to board our cruise ship. The airport pick-up was easy and a driver was present outside of the baggage arrival holding a sign with our names. The same convenience was given the following day outside of the cruise terminal. Our city tour guide was one of the owners. She gave our group, as well as four other travelers, the option to choose travel routes and time needed for each stop. Her knowledge and her English was very good. I give it my recommendation. Well we were picked up at the airport by Viviane straight to the car then to hotel my wife and myself the only pick up in an audiA4 nice clean and efficient a good running commentary on the way to the hotel dropped us so we could check in and quick shower for the rest of our tour an hour later. Our tour guide picked us up in a newer Audi at the airport and took us to our hotel. We were the only ones on the tour, so being picked up in her Audi is probably not an everyday thing. She gave us an hour to get situated at our hotel and then picked us up and took us to Sugarloaf. We were there for about 2 hours or more and had lunch there at the cafe'. The food was great. Afterwards, we went to Christ the Redeemer statue and that took another 2 hours or so. Next stop would have been downtown, but we were worn out and decided to skip that part of the tour and go back to the hotel. The traffic in Rio is awful and it takes forever to get from Point A to Point B. Anyway, I wish I had the tour guide's name handy to post on here, but her card is still packed in a suitcase. We had a really great time in Rio. We were met at the airport by Vivian Beiser who drove us to our Hotel.The next morning we were collected by Vivian and Anna had a wonderful day with both of them.We were taken to the Christ the Redeemer statue by and the Sugar Loaf Mountain both extremely well looked after by Anna. Vivian drove us to some amazing places and pointed out some very interesting sights. We had a really good experience and teally enjoyed ourselves. Vivian's husband met us at the airport and took us to our hotel. Later Vivian came back with the van and picked us up. Gave us a fantastic tour of the highlights of Rio and returned us to our hotel at the conclusion. She speaks wonderful English and is so warm and helpful. She is very knowledgeable and pointed out not on the history but told us much about the culture of this great city. Worth every dollar we paid. Great one day tour before we boarded our ship to take a 14 day cruise of South America.